Who’s afraid of Ubuntu Women? At the recent Ubuntu Developer Summit, there were three sessions held to discuss the future of the Ubuntu Women project. Unfortunately, I was unable to attend the first two, because I didn’t realize the first one was happening, and I had a scheduling conflict for the second. The first session was video recorded, and hopefully the recording will be made available soon. While attending the third and final session, I tried to catch up on the earlier discussion as I listened to what was being said. The first thing I noticed in the Gobby notes was a link to an existing roadmap for Ubuntu Women. I hadn’t seen that document before, and was encouraged to see that it included concrete, measurable goals for increasing the participation of women in Ubuntu. In particular, it presents a goal of increased representation in Ubuntu governing bodies, which I think is an important step in promoting gender diversity in the project. People want leaders they can identify with. The next thing I found in the document was a list of goals. I asked about the relationship between the goals in Gobby and the ones in the wiki roadmap, and someone explained that the goals in the wiki were long term, while the ones in Gobby were short term (to be completed in the 6-month Lucid cycle). The group seemed to feel that there was confusion about what this IRC channel was for. A couple of men in the room said that they didn’t know whether they could or should join the channel, because it had the word “women” in the name. The core of the issue seemed to be less about purpose than governance. The group was concerned about the fact that the channel was not publicly logged like most other Ubuntu channels, and that this gave the impression of it being a “fiefdom” within the community, or a place where people would “gossip”. As far as I’m aware, there is at present no requirement that Ubuntu channels (official or unofficial) must be publicly logged, and there are many channels which are not. If this is considered to be a requirement for a healthy IRC community, then the Ubuntu IRC council would be in a good position to put forward such a policy. I don’t think I have enough experience in regulating IRC discussions to say whether this is the right thing to do, but it seemed a bit odd to me that this came up in the context of #ubuntu-women. It isn’t clear to me what problem this is meant to solve, and whether it is consistent with precedent (again, I’m not very familiar with IRC governance). There was some confusion over why folks might not want the channel to be logged. Kurt suggested that if the conversation adhered to the Code of Conduct, there should be no reason not to publish it. I suggested that there were many occasions where a conversation might be appropriate to keep “off the record” while still following the code of conduct, and that these were separate issues (standards of behavior versus privacy). The group’s agreed actions on this topic included agreeing and documenting guidelines for behavior in #ubuntu-women, and arranging for the conversations in the channel to be publicly recorded. This objective seemed to acknowledge that something would be lost if the conversations in #ubuntu-women were made a matter of public record. The group therefore proposed the creation of a separate channel, which would still be logged, but only the Community Council would have access to the logs. The reason for this seemed to be, again, the need to ensure regulation, and the concern that without oversight, channel participants would misbehave. While a safe space does require oversight in order to be maintained, the goal of involving the CC seemed to be general governance of behavior rather than the safety of women. The group seemed to acknowledge that this idea needed more work, and in particular wasn’t satisfied with the terminology of safe space. The agreed actions were to create the new channel, document guidelines for behavior in it, and arrange for the conversation there to be logged for the Community Council. The group seemed to feel that, in order for the team to meet its goals, it was important to implement some form of government, and that the appropriate structure (at least initially) would be to have a single leader. They proposed to define the responsibilities of such a role, solicit nominations from the community, and ask the Community Council to appoint a leader. I asked why the team could not appoint their own leader, and they explained that the team was not well defined enough, e.g. the Launchpad team is open for anyone to join. Without explicit membership, it’s difficult to organize a fair election. They suggested that the appointed leader would go about organizing the team to the point where it could govern itself more effectively. There seemed to be some concern that this would be controversial. After the written goals had been reviewed, Amber said that in her view, the true value of the sessions had been to change the perception of Ubuntu Women in the community, and that the perception had been very negative. All of the vocal participants agreed with this assessment, seemed to feel this was an important problem to solve, and felt that great progress had been made during the course of UDS. I was surprised by this, because I hadn’t encountered this perception myself, and so I asked to hear more about it. Several people asserted that that there was a problem, that Ubuntu Women and/or its IRC channel were perceived in a negative light. Two men in the room offered anecdotes: one didn’t think he should join the IRC channel because it had “women” in the name (which seems like a different issue), and another said that someone in his LoCo had advised him to avoid it because it was hostile. I didn’t really understand all of this, but I didn’t want to derail the conversation, particularly as I had missed the first two thirds of it. In talking to people following the event, the issue at hand seems to be the IRC channel, #ubuntu-women, rather than Ubuntu Women itself. The channel, at one point, had become a sort of common meeting place for women in various geek communities, and was a place where they would sometimes blow off steam, or conduct broader feminist discussions beyond the scope of Ubuntu Women. This was apparently a bit off-putting to the uninitiated, as well as to some of the channel’s regular participants. Some time ago, #ubuntu-women reverted back to its original purpose and the other discussion moved elsewhere, but it seems that this perception remained among some members of the Ubuntu community. This also may explain why I’ve been hearing that people are confused about the difference between Geek Feminism and Ubuntu Women, because some of the same people are involved in both, and discussed both on #ubuntu-women. Hopefully that’s the end of this apparent stigma, and Ubuntu Women can get on with the business of helping the Ubuntu community to welcome more women. This week, I’m in Dallas, Texas working at the Ubuntu Developer Summit. Hundreds of Ubuntu developers and other community members are gathered to discuss the future of the project, particularly the 10.04 release. Developers are engaged in technical discussions about how to implement new features for the release next April. Obviously, a week is not enough time to decide, design and plan half a year of work, but we try to fit as much as possible into the week, because it is such a rare opportunity for us to work together face to face. In order to make the best use of our time, there is a very full schedule of sessions, and we do a great deal of advance preparation. There is a persistent rumor that UDS is where we decide what to do in the next cycle, but this isn’t quite accurate. UDS is where we primarily figure out how to do what needs to be done. Naturally, UDS is a sea of ideas, thanks to all of the creative thinking which happens among attendees, and we do dream up and decide to do new things there. However, most of this is determined well before we all board airplanes to travel to UDS. Brainstorm is constantly collecting and ranking suggestions from Ubuntu users. Ubuntu development teams hold public meetings on IRC where they discuss ideas and plans. Canonical stakeholders submit requirements for their needs. All of this information is aggregated, sorted, evaluated and prioritized, largely by the heroic engineering managers at Canonical, who then develop the core of the agenda for UDS. 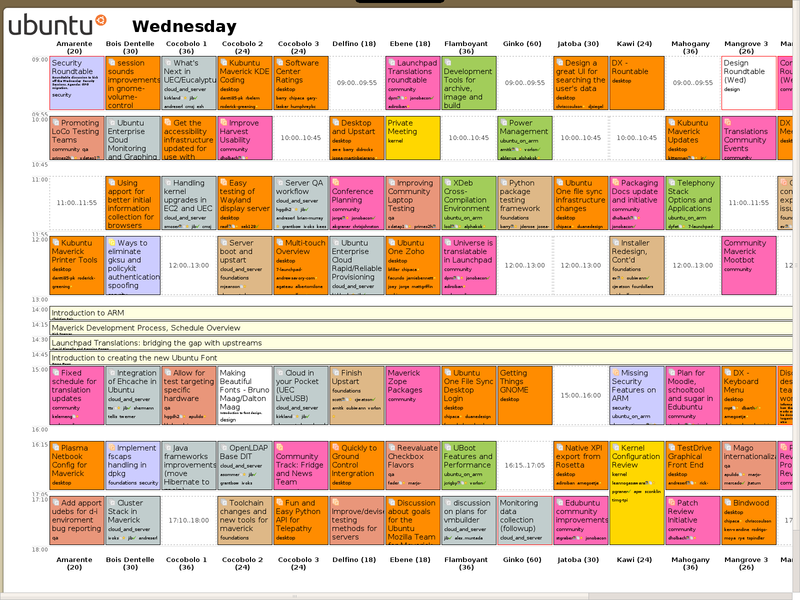 Additional sessions are then added as they come up during the week, when there is space. At this particular UDS, I am moderating the server track, where we’re hashing out the details of our projects for Ubuntu Server Edition 10.04. 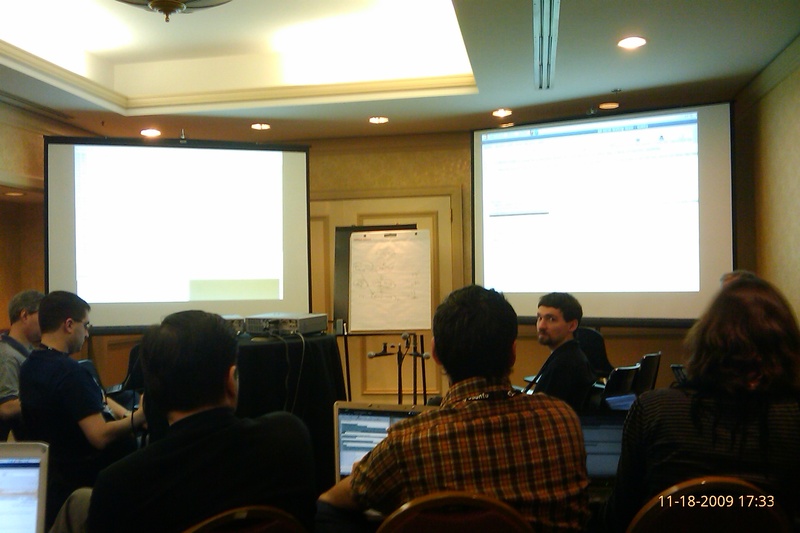 Being a UDS track moderator makes for a very busy week, with back-to-back sessions all day for five days straight. It’s only Wednesday, and I’m feeling a bit fried already, having been away from home for over two weeks. In each session, there is a discussion between the developers working on the project, the other UDS attendees who are interested in it, and any random folk who listen in on the audio stream and add questions or comments via IRC. The participants take notes using Gobby and then publish them in the Ubuntu wiki, where they are developed into specification documents tracked in Launchpad. Those specifications are further broken down into work items, which we can use to maintain a burn down chart. Rick Spencer, our desktop engineering manager, gave a presentation this afternoon about how that process will work. The burn down chart will give us a tool for establishing whether we are on track to complete our work, or if we are under or over committed, and make adjustments to our plans as needed. I have a sense of tremendous momentum going into this release cycle, which will culminate in our third LTS (long-term support) release of Ubuntu. If you registered to attend in person in Barcelona, you’ll be receiving an email with a (different) link to the (same) survey. Please use that one instead, so that we can easily sort feedback from local and remote participants.